There were cheers around Germany when Chancellor Angela Merkel announced last year, in the wake of the Fukushima disaster in Japan, a swift end to nuclear power in favor of renewable energy sources like wind and solar. But only 18 months into the plan, the cost of the switchover is beginning to sink in. Some politicians, fearful of losing popular support for the transition, are demanding an overhaul of the way it is financed. 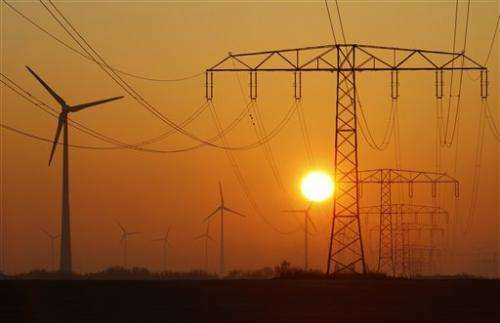 The country's four main grid operators said Monday that households will from January see a nearly 50 percent rise in the tax they pay to finance the switchover—from €3.6 cents to €5.3 cents ($6.7 cents) per kilowatt hour. A typical family of four will pay about €250 ($324) per year under the tariff, including a sales tax. "Electricity should not become a luxury item," warned Michael Fuchs, a leading lawmaker from Merkel's center-right coalition. "The energy switchover will at the end only be successful when met with broad public support." Nuclear power has been controversial in Germany for decades and opposition swelled after the 1986 disaster at the Chernobyl plant in Ukraine sent a radioactive cloud over the country. Tens of thousands of people took to the streets after last year's Fukushima nuclear disaster urging the government to shut all reactors quickly. Merkel's government decided to shut down the country's eight oldest reactors immediately and speed up the phase-out of the remaining reactors. Nuclear power's share of the German energy market has since declined from 23 percent to about 17 percent, with renewable energies shooting up from 20 percent to a quarter. Now, however, complaints are growing about the rise in costs of electricity, particularly for lower-income families. Germans already pay some of Europe's highest electricity prices, averaging about 24 euro cents (31 US cents) per kilowatt hour compared with about 13 euro cents in France or 14 euro cents in Britain, according to EU figures. Germans have long been paying a surcharge on power bills, which guarantees producers of alternative energies a return on their investment above market rate. That's widely credited with boosting renewable energies and making Germany a leader on so-called green technologies. Under the current system, however, the amount of surcharge is automatically linked to the amount of energy produced by renewable sources. As the alternative energies' production rises, so does the amount Germans must pay. "The surcharge has more than quadrupled since 2009. It has crossed the tolerable level of pain," said Economy Minister Philipp Roesler. He urged a quick reform of the subsidy system, saying it has spiraled "out of control." The tax totaled €17 billion ($22 billion) in 2011 and analysts expect it to top €25 billion next year—or about 1 percent of the country's economic output. 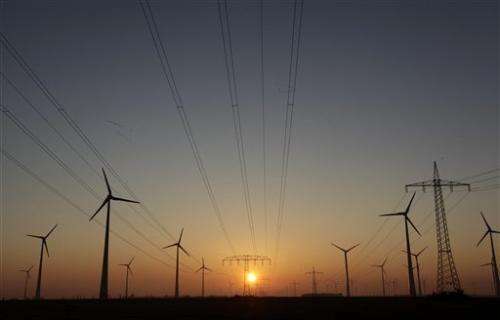 That is set to keep increasing as government plans call for generating 40 percent of electricity from renewable sources by 2020 and up to 80 percent by 2050. Reaching those ambitious targets will likely require investments of up to €300 billion ($390) over the next decade, according to analysts' forecasts. "The energy switchover won't lead to falling electricity prices. Here we should tell people the truth," said Felix Matthes of Germany's renowned Institute for Applied Ecology. While polls consistently show that the majority of Germans is in favor of phasing out nuclear power, the increasing cost is likely to test their resolve. In a poll released Sunday, two-thirds of people surveyed said they are not prepared to pay more than €50 to finance the switchover—far less than the increase coming next year. About 79 percent of the 1,001 people surveyed last month by pollster Emnid—on behalf of pro-market lobby Initiative New Social Market Economy—said rising energy bills were an important issue for them in determining whom they vote for in next year's national election. The poll did not specify a margin of error. Changing the system won't be easy. Last week Environment Minister Peter Altmaier presented a complex roadmap aimed at holding costs in check. But cutting renewable energy costs has proven difficult in the past, in part because the overall goal is popular and because so many groups—from families who bought solar panels at subsidized prices to big companies that have invested in technology development—profit from the system. Altmaier acknowledged that it is unlikely changes to the system could be enacted by parliament before next year's elections. "The electricity price goes up, and the population's support for phasing out nuclear power is declining," Germany's center-left opposition leader Sigmar Gabriel warned on Sunday. His Social Democrats argue that the government is unfairly burdening households for the transition, especially hurting the nation's poorest. An average household spends less than 2.5 percent of its monthly income on electricity, but that share now tops 4 percent for low-income households, according to the German Institute for Economic Research (DIW). Some politicians, both on the left and right, have called for increasing welfare payments to the nation's poorest to offset rising electricity prices, which have shot up by about 44 percent since 2005. "If we want to make sure that hundreds of thousands of families won't sit in the dark this winter, the government must act fast," said Ulrich Schneider, head of the Equal Welfare Association, an umbrella group of social organizations. But Merkel's government also hopes that pushing through the energy switchover will give the country an upper hand when it comes to exporting green technologies as more nations seek to close down their nuclear power industries. In Japan, the government has vowed to reduce and eventually phase out nuclear power, as has Switzerland. France this year also announced plans to promote renewable energies to reduce its dependence on nuclear power. In Lithuania on Sunday, voters rejected the idea of building a new nuclear power plant with a two-thirds majority. Matthes of the Institute for Applied Ecology said that people are more likely to accept the increases when they realize that the energy sector's transformation is also a hedge against rising fossil fuel prices and a step toward energy independence. "I think it's better to invest 1 percent of our GDP per year in expanding renewable energies at home than transferring increasingly high sums to people in Russia or the Middle East who are making a lot of money on fossil fuel reserves," he said. Hmm. Time to sell my stock in Siemens. told you so! Also, Japan is smoking some serious shizzle thinking they can phase out nuclear power. Replace it with what..unicorn farts? They're bitching about 40 year old tech being old...well yeah! Instead of phasing out fission like babies, they should be investing heavily in next gen reactors along side renewables. This is a good reason why so few people actually get involved in politics. I am all for renewables, don't get me wrong, I think it's a good idea for homes to have domestic power sources. However, can they, at their cost and subsidisation, reliability and efficiency, really be considered a baseload alternative to nuclear for a whole nation? I hope Americans come to this realization too. The 1 acre of algae making 1000 theoretical gallons of biodiesel ---UUhhh--- ain't working so well either. I WISH IT WOULD! Here in Florida a 40 year OLD BWR NUKE PLANT's reactor concrete retaining wall cracked while under repair. then the repair cracked. Now they are talking 4 years and $8 billion to FIX This OLD PIECE OF CRAP, and it will go on my electricity bill. I had friends working there 35 years ago, & they called it "3-Mile Island South". Guess why. If people listen to environmentalists the following is assured to happen. The environement will suffer AND you will pay more for a product. Only a progressive idiot would believe that renewables can replace nuclear or conventional power. Maybe updating and reinvesting into nuclear is the answer.. Gee what did the germans expect to happen with wind and solar energy their bill to decrease? If people listen to free-trade radicals the following is assured to happen. You like to whine about the costs of renewables, but nukes and fossil fuels have their own externalized costs that you don't pay by off-loading them onto your progeny and the rest of the world. Which is a very "personally responsible" and "market-driven" strategy, to be sure. Meanwhile, renewables only get cheaper and more efficient with every passing year. Renewables are the future. The Germans seem to understand that. Leave the conventional nukes for aircraft carriers and deep space probes, where they belong. Now, maybe there's room for LFTRs or some such (that don't pose meltdown or weapons proliferation danger). We should explore those alongside renewables. But "conventional power" is a self-defeating dead end. Renewables are the future, like it or not. What we consume now is gone forever, but the main cost is passed on to future generations. A recent study found that the cost of 'saving nature' is 75B p.a - one fifth what humans spend on soft drinks. We are sucking our planet dry. Mother Earth has cancer. "Mother Earth" couldn't care less about the humans "sucking it dry". The earth will be here for billions of years after we are gone. Even then, lets say the Earth can think about such things, the earth is doomed any way you look at it. Wouldn't it be nice if the humans it gave birth to could spread out at least to the rest of the solar system and continue after the sun destroys the inner planets? It is we Humans that are going to suffer what ever fate we decide. Though humans are still "cave men" with limited ability to curb basic brain directives. We might be able to develop a "sustainability" society, but were going to get whacked by a mega disaster eventually. Time to sell my stock in Siemens. Siemens has announced (last year) that it will stop building nuclear powerplants anywhere in the world starting 2022. I think no one expected the changeover to be for free. If it costs a bit: so be it. It's always cheaper to go for destructive/waste producing technologies than for sustainable ones in the short term. However, we're not here for the short term. You like to whine about the costs of renewables, but nukes and fossil fuels have their own externalized costs that you don't pay by off-loading them onto your progeny and the rest of the world. Cost comparison per MWh, nuclear is one of the cheapest (http://alturl.com/8jifm) and, even with estimates that nuclear is not the cheapest, it must be considered what wind and solar are and are not capable of achieving. What do you mean conventional nukes? Oak Ridge ran an MSR for four years without any disasters and that was decades ago, we can do better. If we change our reactors for Gen IV we'll be laughing all the way to the bank. If you include the cost for safe storage of the wastes nuclear comes out at 2$ per kWh. As someone already noted: nuclear is only cheap if you let others pay the main part of the bill (as is the case with fossil fuels). If we change our reactors for Gen IV we'll be laughing all the way to the bank. Money isn't everything. I'll take quality of life over more money any day. "If you include the cost for safe storage of the wastes nuclear comes out at 2$ per kWh." "Money isn't everything. I'll take quality of life over more money any day." Cheaper and reliable energy = higher quality of life. More expensive and less reliable energy = lower quality of life. As for the article, this outcome was obvious from the start. The myth of cheap renewable electricity falls apart when the portion of intermittent sources in the electric grid reaches certain percentage, after which you need to build costly storage and transmission grid upgrades, or face problems with grid stability. These are the hidden costs of renewables. That does not mean renewables should not be included in the mix, but it means the 100% renewable powered grid is a pipedream. Without expensive upgrades and storage, the majority needs to come from base load sources. And there the choice is only coal, natural gas or nuclear. So unless Germany goes for the first two alternatives (from the increasing emissions it looks like that), phasing out nuclear is a mistake. Cheaper and reliable energy = higher quality of life. No. The equation isn't that simple. Living next to a nuclear rector or a coal power plant will impair your quality of life no matter how cheap the energy is. Rising earth temperatures because of CO2 from fossil fuels will impair your quality of life no matter how cheap the oil/coal/gas you burned to get it is. More expensive and less reliable energy = lower quality of life. Money is not the solution to everything (or to anything much if you want to come right down to it). Least of all to the quality of life. No. The equation isn't that simple. Living next to a nuclear rector or a coal power plant will impair your quality of life no matter how cheap the energy is. To what extent does living next to a nuclear reactor impair your quality of life? Living within a 50 mile radius of a nuclear power plant for a year will expose you to 0.08µSv. That is to say, less radation than eating one banana (0.1µSv). Compared with living within a 50 mile radius of a coal plant (0.3µSv), particularly as there is not any pollution, this is pretty peachy. Coal and nuclear are not equal. How many nuclear disasters have there been, compared to the over 400 operational today? I second that: haven't seen that figure before. However, it is a fact that nuclear energy advocates chronically ignore the costs of waste storage/containment and/or reprocessing. I haven't seen very many objective attempts to assess true total costs of nuclear power. This is probably at least in part because nobody knows what future tech developments WRT waste treatment and/or containment might occur. According to Benjamin K. Sovacool, the marginal levelized cost for "a 1,000-MWe facility built in 2009 would be 41.2 to 80.3 cents/kWh, presuming one actually takes into account construction, operation and fuel, reprocessing, waste storage, and decommissioning". The nuclear energy disaster was a self fulfilling prophesy. How else to describe the continued usage and construction of poorly performing 80 year old technology developed in the 50s by a bunch of military techs that were relatively insensitive to risk issues and in a race with USSR to make bombs. Some fairly rational people knew our designs were "junk" and started a program to update and replace nuclear power plants. BUT NO! Ignorant peace activists who meant well but were arrogant that ALL research into nuclear fission meant applications for war were leveraged by politicians looking for a straw man to whip up a frenzy against pretty much brought progress in nuclear energy to a standstill. And as the peace activists petered out, the baton was taken up by environmentalists many of whom were from the peace movement. So here we are now stuck with the old reactors and all their waste from the past decades still burning the far worse fossil fuels. Thanks guys. Yes, it's a little unfair assuming all nuclear power is the same, let alone all nuclear power is the same as fossil fuels. A lot of progress has been made. Various models for nuclear power were created at the same time, that's what was born from the research, it wasn't just one reactor type. There are attempts at making smaller thorium modular reactors and these can be built underground and have a number of safety features that modern LWRs do not. It's like saying a smartphone is inconvenient because its chunky, heavy and can't be carried around, assuming it's like the old Bakelite phones. Just because they have a similar function doesn't mean they operate in the same way. To what extent does living next to a nuclear reactor impair your quality of life? Much like living next to a chemical plant impairs your quality of life - or living next to a house where someone has stashed a nuclear bomb. It's not the toxicity - it's the constant awareness that at any moment things could go wrong. And as nuclear powerplants go 'next to' means: several square kilometers. I understand that 'several hundred square kilometers' means nothing in the US or Russia or China (just evac a few people and write it off). But you must come to grips with the fact that for almost all other countries that means 'game over'. And a few cents less on the kWh isn't worth that. It's hard to see similar dangers emanating from alternative power plants. And even worst case scenarios (dam breaking, gas pipeline/storage exploding) aren't show stoppers for a country/society. How do thing go wrong at any moment in an MSR/LFTR? These are what I am advocating, not nuclear in general, sorry I was not clear. This issue can be fixed by educating the public. If you show them that the risks of harm they face by living near to a modern nuclear power plant are comparable to the risk of them being hit by a meteorite, and they endured much greater risk of harm by a medical x-ray or by driving on a highway, such fears would disappear. Its true that humans are biased to judge small probability of a spectacular and unusual harm as worse than higher probability of a much more mundane harm, but thats a bias that can be corrected by education. Thing is, nuclear accidents have the potential to irradiate an entire nation (and even neighboring nations), rather than just one person. Most people are prepared to tolerate individuals being killed at low rates much more readily than entire nations being wiped out even if very infrequently. Ooookaaay... Here is my 2 cents worth; some of it from personal experience. It isn't just about nuclear accidents. The levels of radiation around such plants may well be safe (ie within what is determined to be under a certain level), but 'safe' does NOT mean 'without impact/effect'. These levels are still higher than the 'normal' background radiation that all life evolved with (& possibly influenced by, to some degree). A number of years ago, an experience brought this home to me. How do thing go wrong at any moment in an MSR/LFTR? Earthquake and break in containment (which is rather larger and more fragile than in other types of reactors because of the need for pipes, pumps, heaters, etc,). This doesn't lead to meltdown, but to release of radioactivity into the atmosphere. The real problem with radioactive contamination is: we have no plan B for cleaning it up. When it's out there it's out there and we'll just have to live (or die) with it. A technology that has no plan B is not a safe technology. The MSR containment is smaller than in conventional reactors, even with pipes and pumps. By using liquid salt as the coolant instead of pressurized water, a containment structure only slightly bigger than the reactor vessel can be used. Light water reactors use pressurized water which flashes to steam and expands a thousandfold in the case of a leak, necessitating a containment building a thousandfold bigger in volume than the reactor vessel. The LFTR containment can not only be smaller in physical size, its containment is also inherently low pressure. Problem with salt cooling is this: If it leaks you can't repair it or compensate by upping the presure. If it breaks you can't compensate by flooding the area with water. Liquid salt cooling has no plan B (only plans A2, and A3 which are redundant systems - but no plan for catastrophic failure). Liquid thorium reactors have the problem that if stuff breaks or cools the salt solidifies (during operation the salt is barely above melting point). Once the salt has solidified at any point in the system the entire core is a loss. Ask the Russians about their experience with salt cooling (they used these types of reactors on their nuclear subs). It's tricky (and corrosive) tech. That we CAN control it isn't the uestion. The question is: Can we control it under all circumstances. And the answer is: no. "If it leaks you can't repair it or compensate by upping the presure. If it breaks you can't compensate by flooding the area with water." That would be a problem if the salt cooled ordinary fuel rods. But since the fuel is part of the salt itself, any leak would also carry the fuel with it, shutting the reaction. And why exactly you cannot cool the salt with water? Its not like FLiBe has any violent reactions with water or air as sodium has, its chemically inert ionic compound. Of course there is no reason to do it, but it would not be impossible. "Liquid salt cooling has no plan B (only plans A2, and A3 which are redundant systems - but no plan for catastrophic failure)." There is no need for plan B. Salt leaks, reaction stops, salt cools and solidifies. Thats the end of it. "Liquid thorium reactors have the problem that if stuff breaks or cools the salt solidifies (during operation the salt is barely above melting point). Once the salt has solidified at any point in the system the entire core is a loss." Salt solidifies, the cooling stops, salt heats up, melts again, the cooling resumes. Its a self-correcting system. And you can also use outside heat source to melt the solidified salt if you want to accelerate the process. Solidified salt does not mean loss of the core. "Ask the Russians about their experience with salt cooling (they used these types of reactors on their nuclear subs)." They used lead cooling (with solid fuel elements), not FLiBe cooling. The only FLiBe cooled (and fueled) reactor was ORNL MSRE. I think Shotman appears more knowledgeable to answer these questions, but I don't think (and I'm sure you're not suggesting) that we should give up on it. Yes a lot of research still needs to go into it, I won't pretend that LFTR is ready to be rolled out across the world, but it has massive potential. We cannot control all circumstances yet - but given enough research we may be able to find out we can, including how to dispose of SNF - and if we can then I'm sure you'd have to agree that they are worth the effort. According to http://www.tampab...2505.ece this is a case of pure incompetence. What happens when an operator with absolutely no experience tries "self medication". Exactly like what happens when politicians get involved in fancy "Windmill" projects. Billions wasted for nothing much in return. I do think we should look into thorium reactors. But more of as an off-world, asteroid-mining, lunar-base, or spaceship technology. On this planet what we need is an indefinitely sustainable, cheap (as in: everyone can make their own at near zero cost without being reliant on utilities), easily maintainable, catastrophe resitant, non-polluting, decentralized, non-limited fuel source reliant, non-geographically selectively available fuel source reliant technology. And thorium reactors just aren't any one of those. A friend of mine had a solution to that: bury it in a subduction zone and let the earth recycle it. Rising earth temperatures because of CO2 from fossil fuels will impair your quality of life no matter how cheap the oil/coal/gas you burned to get it is. I think summer is great. A little less winter will improve peoples lives and lower mortailty. However, temperatures haven't rise for 16 years, so why are you peddling your con game here? Everyone would love to use "alternative" energy , but the problem with "renewable" energy is in it's very nature. Works only when the wind blows, the sun shines, or the river flows. When either of these conditions aren't met they're just scraps of high priced metal which serve no useful purpose. Far more people have died from "dams breaking" than in nuclear disasters like Fukushima or Chernobyl. Look up the literature , millions displaced from their homes while building the dams , extensive habitat destruction. Then the only tech which has higher energy density than nuclear fission is nuclear fusion.